Bachelor in Paradise Spoilers: Who Gets Engaged on “Bachelor in Paradise” 2017? “Bachelor in Paradise” Spoilers: Who Gets Engaged on “Bachelor in Paradise” 2017? Handsome hunks and beautiful women come together on Bachelor in Paradise season 4 in hopes of another shot at love. Viewers are hoping that there will be a record number of engagements on this year’s show. However, Reality Steve let the cat out of the bag with details about what to expect this season. Read on to find out! By now, everyone must know about the famous incident that took place on the set of Bachelor in Paradise, that brought filming to a screeching halt. Warner Bros., the company producing the show, conducted an investigation and found that there was no wrongdoing, thus allowing filming to resume. Strangely, the two contestants at the center of the controversy —Corinne Olympios, and DeMario Jackson— have not rejoined the show, but will appear on the special afterward. As always, some people cannot wait to know what happens this season and want to know if anyone leaves Paradise engaged this season. Keep reading for some Bachelor in Paradise 2017 spoilers! 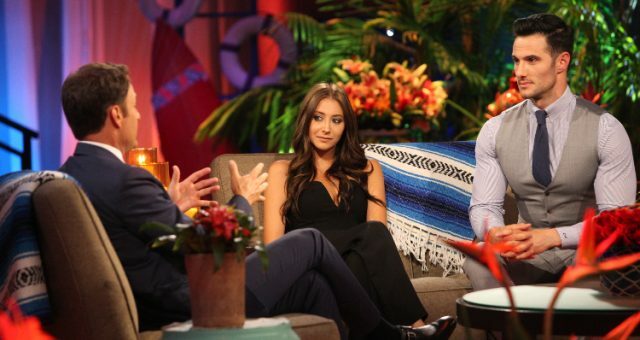 Reality Steve released some spoilers about what to expect on Bachelor in Paradise season 4. Though there have been times that the blogger was wrong, there have also been more times where he’s hit the nail right on the head! Who gets engaged on Bachelor in Paradise 2017? There were initial reports saying that there would be two engagements this season, but according to Reality Steve, that is incorrect. Apparently, nobody will be getting a ring on Bachelor in Paradise season 4! According to Reality Steve, the couples who will make it to the end are Derek Peth and Taylor Nolan, Daniel Maguire and Lacey Mark, Robby Hayes and Amanda Stanton, Adam Gottschalk and Raven Gates, Christen Whitney and Jack Stone, and Jasmine Good and Jonathan “Tickle Monster” Treece. When Chris Harrison tells the couples that they have a choice between going home together, separately, or agree to an overnight date together, Jasmine and Jonathan, Robby and Amanda, and Christen and Jack agree to go home separately. The remaining three couples agree to an overnight date, but the season reportedly ends right after that, which means no engagements. Don’t lose hope! According to Reality Steve, even though nobody gets engaged this season, there is a possibility of someone popping the question during the reunion! Steve wrote in his blog, “It would not be surprising to see an engagement happen at that [the reunion], most likely Derek and Taylor.” There is information to suggest that Daniel might be on an upcoming Patti Stanger dating show, so it is possible that he will not be with Lacey for long. Robby and Amanda are reportedly still together, but no one knows how long this relationship will last. Catch the season 4 premiere of Bachelor in Paradise August 14, 2017, at 8:00 p.m. on ABC. You’re definitely going to want to watch all the drama unfold, and see whether or not these early predictions are accurate!